Melyani, M. (2013). Mindfulness based cognitive therapy versus cognitive behavioral therapy on residual symptoms in recurrent Depression. International Journal of Behavioral Sciences, 7(2), 159-166. Mahdiyeh Melyani. "Mindfulness based cognitive therapy versus cognitive behavioral therapy on residual symptoms in recurrent Depression". 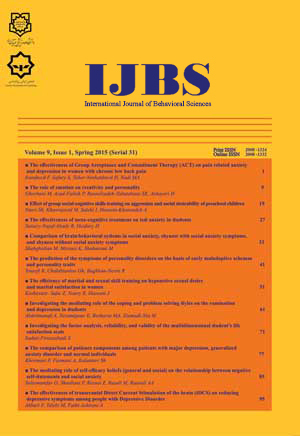 International Journal of Behavioral Sciences, 7, 2, 2013, 159-166. Melyani, M. (2013). 'Mindfulness based cognitive therapy versus cognitive behavioral therapy on residual symptoms in recurrent Depression', International Journal of Behavioral Sciences, 7(2), pp. 159-166. Melyani, M. Mindfulness based cognitive therapy versus cognitive behavioral therapy on residual symptoms in recurrent Depression. International Journal of Behavioral Sciences, 2013; 7(2): 159-166. Introduction: The present study was carried out to examine the effectiveness of Mindfulness-based Cognitive therapy versus Group Behavioral therapy on residual symptoms in Recurrent Depression.Method: It was a pretest-posttest study in which 40 patients suffering from recurrent major depression with residual symptoms were randomly assigned to either MBCT or CBT groups. Data collection was done using Beck Depression Inventory-II (BDI-II), Ruminative Responses Scale (RRS), and Dysfunctional Attitude Scale (DAS).Results: The results of MANCOVA supported the effectiveness of Cognitive Behavioral therapy in residual depression, dysfunctional attitudes, and the cognitive subscale in BDI-II. On the other hand, Mindfulness-based cognitive therapy was shown to be more effective in reducing rumination.Conclusion: In sum, it is proposed that a combination of CBT and MBCT could be more effective in the case of residual depression, dysfunctional attitudes, and rumination than each of them alone.